The late season sees some of the year’s biggest blackfish taken on charter and party boats in deep water. This 15-pound brute crushed a green crab for the author aboard the Orient Point charter vessel Nancy Ann IV. Photo by Tom Schlichter. I hate to be the bearer of bad news but no matter how mild the fall, the end of blackfish season pretty much wraps-up the regular saltwater action at most ports. Sure, there will be a few boats sailing for sea bass, cod and ling, and we’ll hopefully see some herring at the docks, but opportunities to score big a reasonable distance from port dwindle rapidly at this time of year. All that makes scoring well on the last few blackfish trips of the year seemingly more important. Everyone, after all, likes to go out on a high note. With most of the best catches now made in deep-water hot spots or over wrecks in 60 to 120 feet of water, the fishing grows increasingly more difficult as anglers need to cut in heavier weights, anchor more precisely than before and deal with the elements as cold, wind and bumpy seas become the norm rather than the exception. Still, when push comes to shove, the mighty blackfish remains a very catchable fellow. As with most any bottom feeding species in our waters at any time of the year, keeping just a few basic points in mind can really up your scores. 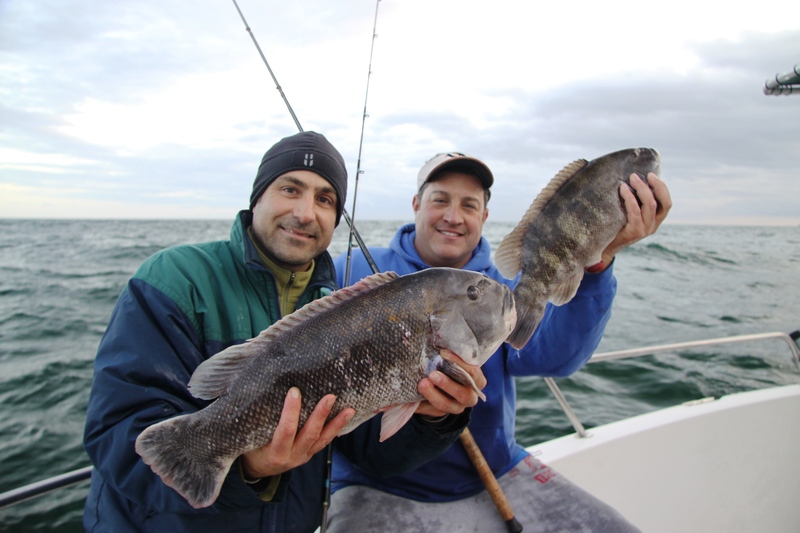 Following are four key points to keep in mind as you pursue the tasty tautog through the very last day of the season. 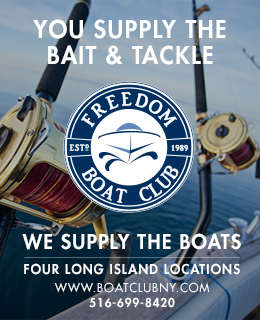 NOTE: Blackfish season end dates vary from state to state – even within the state for New York waters. Be sure to check the regulations before heading out. While blackfish bite right through the end of the season, there’s no promise that the weather will cooperate so dress for the elements. These guys pulled bulldogs through pouring rain while fishing with the Capt. Lou Fleet of Freeport, NY. Photo courtesy of Capt. Lou Fishing Fleet. Baiting up with a dull hook is perhaps the single biggest failure among novice blackfish fans. The later into the season and the deeper you fish, the more important having a sharp hook becomes as you have to overcome line stretch, heavy weights and a blackfish’s tough lips to set the hook. Don’t even consider sliding a crab or clam bait over your barb before inspecting the hook point to ensure it is razor sharp. I check my points repeatedly throughout the day, following every fish I reel up, and immediately if any blackfish wiggles free on its way to the surface. I also check whenever I momentarily hang-up on bottom. The simple process of freeing a hook often blunts the point and this holds true whether using time honored Virginia-style hooks, Octopus-style hooks or even blackfish jigs. Let’s face it, blackfish do well in rocky environments but hook points don’t. If dragging your point lightly across a thumbnail fails to leave a light scratch, it’s time to tie on a new one. Always keep in mind that it’s not the little fish with soft mouths that slip hooks with dull points; it’s the biggest fish with the toughest lips that escape unscathed. 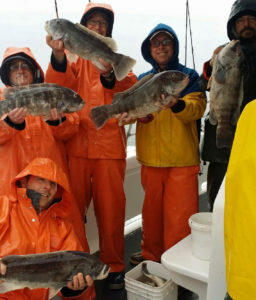 Jigging for blackfish is all the rage these days but that technique is best reserved for shallow water action when the ‘tog are feeding in depths of 40-feet or less. 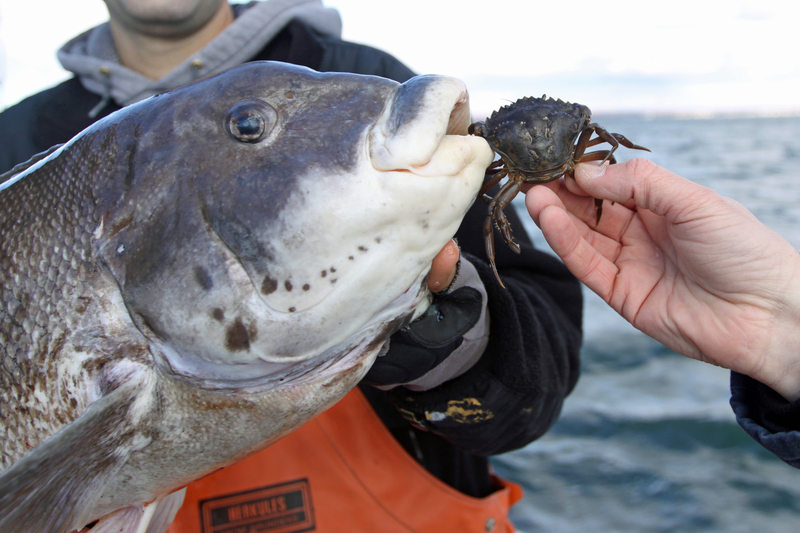 From Thanksgiving on, fishing crabs on a traditional single-hook bottom rig accounts for the lion’s share of bulldogs. With this rig it is easy to change sinkers so you can keep your bait on the bottom as the tide picks up or loses steam. Having a single hook also allows anglers to concentrate on one bite at a time which helps keep you focused on timing the strike just right. How you present a crab bait can make a difference in your catch as well. Most anglers use a pair of heavy shears to cut green or Jonah (white) crabs in half, break off a couple legs and then slide the hook point in one leg socket and out another. Fewer, however, seem to notice that the fish sometimes prefer the shell on or the shell off. Usually, a shelled crab works best. When the fish are feeding thick and heavy, however, you’ll catch more big blackfish if your leave the shell on. This provides a larger profile and thwarts small fish from easily stealing your bait. On days when the bigger blacks seem particularly picky, try stepping lightly on the crab to crack the shell. The biggest bulldogs find it tough to pass up a large crab when its juices are leaching out into the current. With the season growing late, now’s the time to get out with friends and add some fillets to the freezer. Capt. Joey Leggio and Ralph DeAngelo did just that on this trip out of Jones Inlet. Photo by Tom Schlichter. Plain and simple, a straight, overhead hook-set is the surest way to raise a monster tautog above the snags at the beginning of the battle. Many anglers get this part right, but then make the mistake of lowering the rod tip too quickly, giving back just enough line that a tackle-busting white chin can power back into the snags. Drop the rod fast enough to allow momentary slack, and your sinker will fall below the fish, often tearing the hook right out of the crab-crushing maws of a trophy specimen. Get that rod up high overhead and keep the line tight even as your reel down to a more comfortable position later in the battle. Improperly set drags can also compound the initial hook set. Set the drag too light and any respectable tautog will simply power back into the boulders or wreck from which it came no matter how high you hold the rod. A drag with too little give, on the other hand, encourages hooks to tear free and knots or frayed leaders to part during the rock-’em, sock-’em, up and down battles for which bulldog blackfish are so beloved. For most species of fish, I like to set the drag at about one-third of the breaking strength of the line. For blackfish, though, I generally go a little tighter. To connect with the biggest blackfish, you’ve got to wait out the smaller fish that will inevitably toy with your baits. Rapid pecks usually signal bergalls, juvenile sea bass or small blackfish while a substantial ‘tog offers a substantial tug. Keep a finger to your line and you’ll clearly feel the difference. Wait until your rod takes a slight set, or it feels as if the fish is actually dragging the sinker slightly along the bottom, before setting the hook. Be aware, too, that strikes from large blackfish are often preceded by a minute or two of relative calm as smaller fish get out of the way. If the fast raps suddenly stop, be ready for a bigger bite because a bruiser white chin may have just strolled into town.